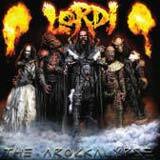 Coming off their 2006 Eurovision victory, Lordi have just released their third studio album, Arockalypse. In order to spread the word about their music around Europe, the band also released Monster Show, a compilation of songs from their first two albums, Get Heavy and The Monstermerican Dream. Of course, the band's new found popularity will undoubtedly cause many metalheads to shun Lordi without even listening to their music. After all, popularity and quality of a band's music are always inversely proportional </sarcasm>. When it comes down to the music itself, Arockalypse is a solid offering of melodic hard rock from the 80's, complete with the lyrical and musical clichés of the period. Lead singer Tomi Putaansuu is an interesting fellow. He used to be in the special effects business for, as you can guess, horror movies. He is also the founder of the official Kiss fan club in Finland. So, what happens when a huge fan of a makeup / costume wearing band and a veteran of special effects in horror movies creates his own band? Lordi! Some may note that the over the top costumes are similar to those of Gwar. Although the costumes of Gwar are a bit more gross (but still cool) in nature, that's as far as the similarities go between the two bands. The music of the two bands are completely different beasts. Lordi plays melodic hard rock that pulls from an array of 80's icons of the genre. They add their own twist to the music by inserting their monster theme throughout all their albums (all three to this point), along with a sizeable sense of humor (or cheese, depending on your viewpoint). Kiss and Alice Cooper are obvious musical influences, but Twisted Sister, Accept, and the 1980's LA Strip scene in general can be heard in Lordi's music as well. This should be no surprise when you see the list of guest musicians who appear on this album; Dee Snider and Jay Jay French of Twisted Sister, Udo Dirkschneider, and Bruce Kulick. The album gets going with an extended skit for an intro. SCG3 Special Report is a news bulletin covering the action from the streets where monsters are attacking the city. Dee Snider makes his only appearance of the album (unfortunately) as the news anchor in this track. While funny at first listen, the obvious fake sound of the newsclip combined with its length of almost four minutes relegates this track to the skip treatment after you've heard it once. From here, the album gets started. Simply after the first spin through the album, it's easy for the listener to realize that Lordi have returned to a songwriting style similar to that of Get Heavy. Bringing Back the Balls to Rock kicks off the album in heavy fashion. This is a heavy guitar driven anthem that features some of the most metallic guitars you'll hear from Lordi (including some nice dual soloing) along with Udo's first (and brief) appearance of the album. The Deadlite Girl is next, and actually sounds more like mid 80's era Accept or more recent U.D.O. material despite Udo himself not contributing on this track. Again, this is another catchy as hell number with some excellent (but not mind blowing) guitar work that proves Lordi is far from just being about the image. These first two tracks are a very good indication of what is to follow. Each track on this album is instantly recognizable, much like the debut. Aside from Bringing Back the Balls to Rock and They Only Come Out at Night which both cross into melodic metal territory, the remaining tracks are excellent 80's style hard rock tracks that fit into the Kiss / Alice Cooper (Trash and Hey Stoopid era) mold. Udo makes more than just a brief appearance on the aforementioned They Only Come Out at Night. This is more of a Udo / Tomi duet that even has that metallic, Accept like guitar sound; very much an album highlight. The prototypical "whoa-oh" harmony vocals are all over this album, very much a cliché that thrived during the 80's. Generally speaking, Lordi makes heavy use of harmony vocals, especially during the chorus lines. This really ensures that the melodies are driven into your mind at warp speed. Lordi makes smart use of keyboard on this album. They don't fall into a trap of overusing the keys, which would really take the hard edge out of the sound. Instead, the guitars are very much at the forefront of the sound, with the keys subtly placed in the background to accentuate the melodies and provide some thickness and depth to the sound; no more. Tongue in cheek humor is spread generously throughout this album, with Who's Your Daddy? being the obvious highlight. This track is to Arockalypse what The Devil is a Loser is to Get Heavy. As I touched on above, I feel it bears emphasizing that Lordi are actually a talented band, not just some scrubs getting by on their image and wacky costumes. Each of the songs on this album has lasting power thanks to excellent songwriting and catchy melodies. The musicianship is also very solid on this album, with the riffs and solos really stepping it up a notch over the band's earlier work. The sound is tight and crisp, thanks to a solid and energetic rhythm section and clear production. The only shortcomings I find with this album are minor. The extended intro is something that even Dee Snider can't save from the "skip" button after the first listen. I'm sure this would work VERY well in a live setting with some theatrics and pyrotechnics as accompaniments, but it doesn't quite gel as a narrated intro track. It Snows in Hell is the ballad of the album, and it features some outstanding guitar work, particularly the soloing. However, as far as ballads go, it's just an okay song at best. Aside from that, Arockalypse delivers ten hard rock gems. Although Lordi's style of music is not all that original, Tomi's vocals add a unique spin to the music. His vocals are lower and more gruff than most hard rock vocalists, actually sounding very similar to Ville Laihiala (ex-Sentenced, Poisonblack) in many spots. After their second album The Monstermerican Dream left me a bit let down, Arockalypse has me pretty excited about this band again. The songwriting is back to where I think this band performs best, and the album is very consistent from start to finish. As an additional point with regards to songwriting; the songs never become repetitive or begin to sound alike. Each song has its own character and sound. With this third album of the band, I hear some improvements and growth in terms of musicianship, with the guitars really sounding sharp on this album (although some of this credit must go to Jay Jay French and Bruce Kulick). Hard Rock Hallelujah is the track that won Eurovision, but there is a steady menu of hard rock bliss on this album to justify owning it if the Eurovision track is your only exposure to the band.